PART I: Are Probiotics The Answer For Everything? 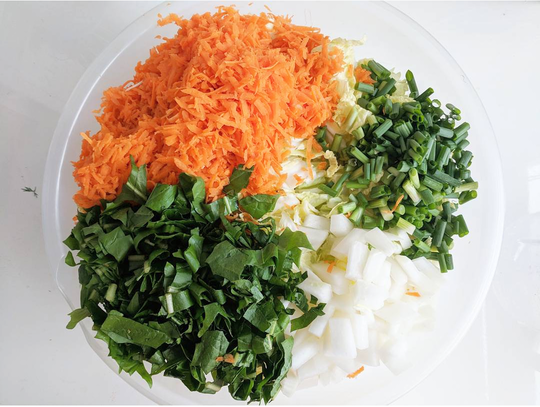 For the equipment you need in this recipe, please refer to this recipe for the basics on Vegetable Fermentation. *Use this recipe as a base but you can experiment any number of ways. 1 crunchy vegetable - I recommend a daikon radish or the equivalent of small radishes. I've also used a jicama (without the skin) and it worked really well. *You might notice that some recipes also call for fish sauce. You can try without first and then try another one where you add it. Set aside 3-4 large cabbage leaves for later. Chop the rest of the cabbage into pieces (just like with the sauerkraut, the size will determine the crunchiness) and place in a large bowl. 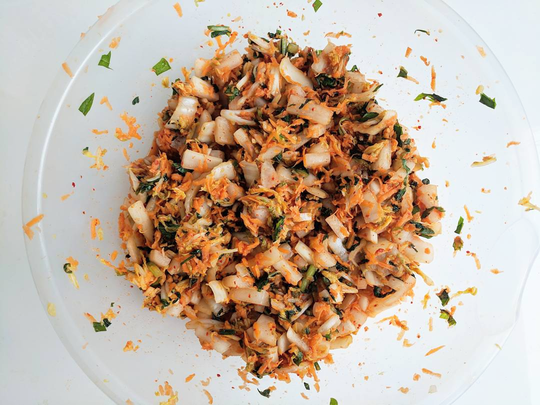 Chop daikon into small pieces (keep larger if you like a little crunch in your kimchi!) and put in a bowl with all of the other veggies to set aside. Place the cabbage in a large bowl and begin to massage the salt into the cabbage. Really massage thoroughly until the cabbage has begun to release water and is turning translucent. You can let it sit in between to let more water release. You can also add more salt to help release more water. 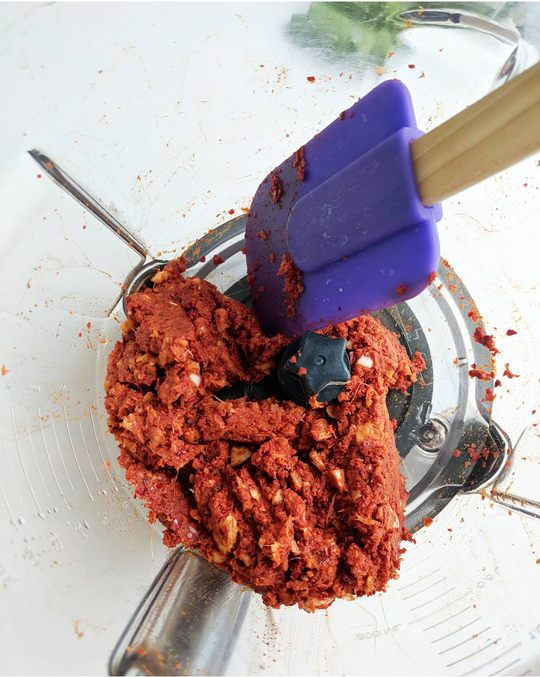 Meanwhile, place paste ingredients in a food processor or blender and process until it forms a smooth paste. Reminder! Don’t touch your eyes or face! Add the rest of the veggies to the bowl with the cabbage and keep massaging and adding the rest of the salt. Keep tasting in between - kimchi should be a good deal saltier than you would normally eat your food. Note: you can also just massage everything (cabbage & veggies) at the same time but you'll need a really big bowl so this saves on space if you do it separately. Just before you think the kimchi is ready, add the paste and keep massaging it for a few more minutes. When you have a few inches of water in the bottom of your bowl you can transfer to your fermenting vessel. Start to add your mixture into the jar and pack it down as tightly as possible in between layers. You’ll want to remove any air pockets. As you push down, more and more water will be released, creating your brine at the top. It’s essential that the veggies be completely submerge and the water is only at the top as you need to create an oxygen-free environment. Keep pushing down and packing until the water covers the veggies. Leave a 2 inch space at the top of the jar (more if you’re using a big jar). Fold the reserved cabbage leaf until it’s roughly the circumference of the jar or you can use a plate for this. Push the leaf/plate down until it is submerged in the brine. This step might sound a bit confusing - the cabbage leaf is going to serve as the separator between the sauerkraut mixture and the brine and stops any small pieces from floating to the top. Add your weight. Again, remember the order goes cabbage mixture, then the leaf separator, then the weight and brine. Cover the jar with your shirt or sheet. Place in a warm spot, away from direct light (like a cupboard you don’t open very often). Be sure to place the container in a shallow dish as excess brine will overflow from the jar for the first few days. 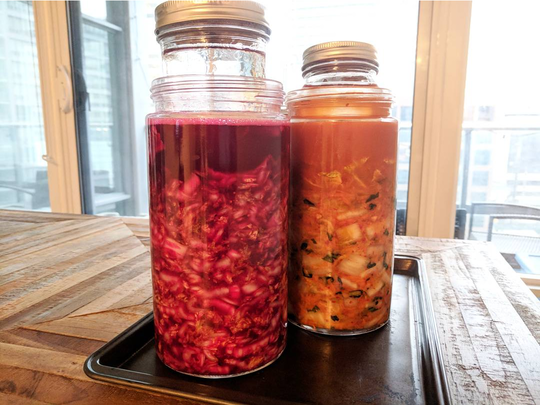 After a few days, begin tasting your kimchi. Some of us like really soft, tangy krauts, others like crunchy krauts. I recommend allowing it to ferment for at least two weeks. When it’s fermented to your liking, top with a lid and store in your fridge. You can also transfer to smaller jars just make sure the vegetables are submerged in brine. If liquid evaporates, add more brine to keep it submerged. It will keep for 6 months or more.